Ken Burton regularly directs the London Adventist Chorale and Croydon SDA Gospel Choir. 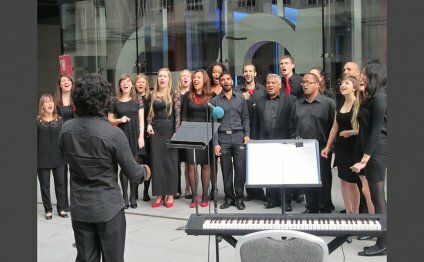 Following the latter’s involvement in several BBC Songs Of Praise performances, he founded the session broadcast choir the Adventist Vocal Ensemble, out of which came a quartet, Tessera, which likewise sings regularly on Songs Of Praise. Ken is a regular adjudicator for Choir Of The Year and has also judged Channel 4’s Gospel Singers Of The Year. He has contributed to all of the series of ITV’s The X Factor, as a vocal contractor, session singer and choral arranger, not only for contestants, but for special guests such as Beyoncé, will.i.am, Christina Aguilera, Robbie Williams and Rihanna. Ken has worked as a vocal coach for the UK’s Cultural Olympiad choir Youth Music Voices, which performed at WOMAD and the Royal Opera House.